I have been trying for months to figure out what color we wanted to paint in our hallway. 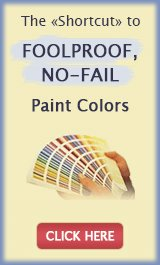 After cleaning out our storage closet in the basement, I realized that there were several paint colors from around the house that we had plenty of leftover paint from. One of the rooms we had paint leftovers from is our kitchen. 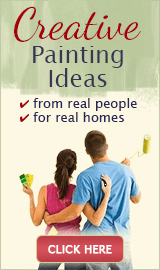 I had painted it burgundy with a green accent wall and didn’t think to buy less than a gallon of the green paint. I love the accent color that we painted that wall in the kitchen (Benjamin Moore – Rosemary Sprig) but because of the large windows on that wall and family photos people don’t necessarily notice it the first time they’re in my kitchen. I decided to put this color in our hallway too. It’s a soothing green and went on easily. Most of the trim in our house is painted white and the trim just popped on the green wall. A mirror that I purchased without knowing exactly where to put it, looks great next to the bathroom door and filled the space perfectly without looking too big or cluttering the wall. Everyone that has come into our house notices the new color on the wall and comments on it. Some of our guests recognize it from the kitchen and for others we have pointed it out but either way we’re so happy with it. Now my only problem is finding a color to paint the rest of the hallway and living room that connects to it. 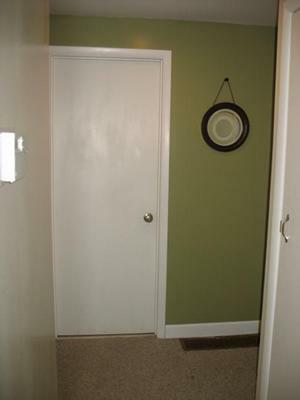 Green is such a soothing color and this shade you've picked looks great in your hallway. I'm not surprised everyone has noticed it, it's bright and stands out well. Lovely choice. What color and paint is this? Love it!! !